Eugenio Garza Jr. is a recent retiree of U.S. Customs and Border Protection (CBP) with over 42 years of federal service. During his career, he was widely recognized as an expert in international border security management issues. 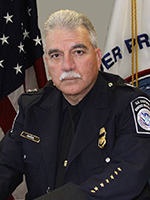 With Mr. Garza’s years of service in leadership positions at CBP he brings extensive experience, a breadth of knowledge, and insights to the CT Strategies team. Most recently, he was the Director of Field Operations at the Laredo (Texas) Field Office for CBP, the largest federal law enforcement organization in the United States. While serving as Director of Field Operations, Mr. Garza provided oversight and guidance to the operation of eight ports of entry across Texas. He helped lead a workforce of more than 2,600 employees, all charged with the mission of protecting, defending, and enforcing America’s borders between lawful ports of entry. Mr. Garza was responsible for annually overseeing the processing of over 2.7 million commercial trucks, 18.9 million privately owned vehicles, and 50.5 million passengers and pedestrians. He also created partnerships with the private sector and other federal, state and local law enforcement agencies to include the Government of Mexico. Mr. Garza previously served as the Port Director at the Port of Laredo, Texas for CBP. When CBP was reorganized under the U.S. Department of Homeland Security in 2003, Mr. Garza was responsible for coordinating operations and employees from legacy Customs, Immigration, and Agriculture Inspection Services. He also provided technical advice on the import and export of cargo to the trade community, as well as on the detention and apprehension of those suspected of violating the laws and regulations enforced by CBP. He also implemented an AEO-type program to effectively promote trade programs and led the implementation of an automated cargo processing system. When working at the Port of Laredo he was the spokesperson for the agency at functions with the trade community, business community, federal, state and local agencies. He has addressed the President of the United States, State Governors, U.S. Congress, and high-level Government of Mexico Officials. Prior to working in Laredo, Mr. Garza was the acting Director for the National Canine Programs’ Anti-Smuggling Division, where he oversaw staff and managed the national canine budget. He also served as a Supervisory Customs Inspector at the Port of Entry Eagle Pass in Texas. Here his responsibilities included detecting violations of customs and other agency laws concerning the importation of merchandise, passenger operations, and aircraft arrivals and departures taking appropriate enforcement actions. ​Before beginning his career with CBP, Mr. Garza served in United States Military. While serving in the military he was assigned as a Security Policeman Canine Enforcement Officer and provided security to all military assets that included airplanes, munitions and base housing areas. After leaving the military he received a BS in Criminal Justice from Laredo State University.